We are looking for a solicitor to join the Corporate & Commercial team in our Chester office. To be considered for the role you must be qualified to practice as a solicitor in England and Wales with between 2 to 5 years PQE of Co/Co work and a commendation or distinction in the LPC. You will have the ability and willingness to do corporate/finance work AND commercial contracts work. You will be a confident person with excellent communication skills who is at ease when dealing with clients; ensuring that each client receives an excellent level of service. You will also have a good level of commerciality and mathematical ability. You will have the ability to manage your workload; managing a number of cases at any one time. You will also have an excellent eye for detail and the desire to get things right first time. You will have a willingness and aptitude in getting involved in the team/firm’s marketing and business development activities and therefore possess excellent client facing skills. You will have a full UK Driving licence and your own vehicle. Our highly regarded Corporate & Commercial team has an enviable reputation and is highly ranked in the independent legal guide The Legal 500. Details can be found at here. We are a law firm with offices in Chester, Shrewsbury and Manchester with more than 20 recommendations from the two main independent legal directories, Legal 500 and Chambers & Partners. We pride ourselves on providing high quality, results focused legal advice through a dedicated partner-led service. Much of the work we undertake is ‘bespoke’, requiring unique solutions to unique problems and a breadth of commercial understanding and appreciation. The firm positively encourages solicitors at all levels to take on as much responsibility as they are comfortable with. We want individuals who are keen to build and broaden their technical abilities, whilst at the same time developing client-facing and marketing skills. We will provide the support and training you need to do this. The firm is growing, ambitious and constantly evolving – and we expect the same from our solicitors. This position is a full time position with normal working hours being from 9am to 5:30pm, Monday to Friday at our Chester office. We are an equal opportunities employer and are committed to ensuring that all job applicants are treated equally and without discrimination. 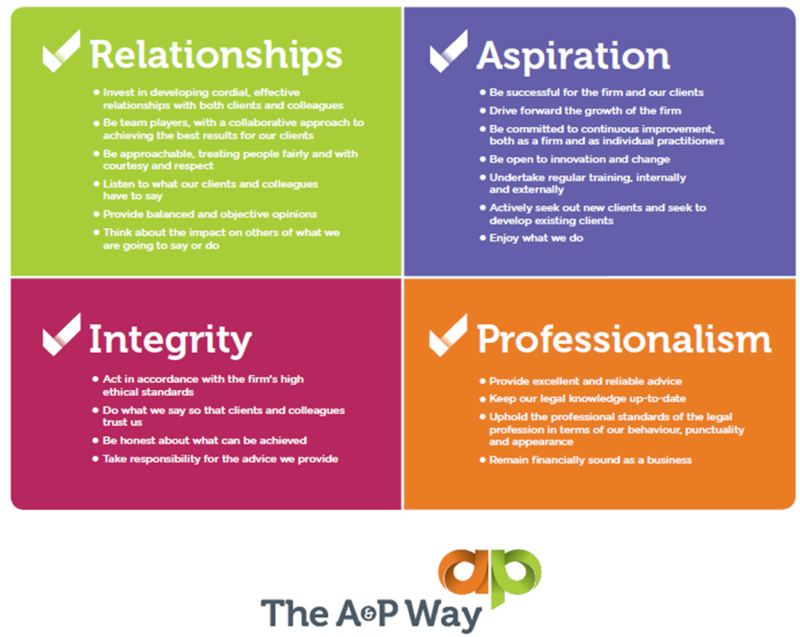 As a firm we proactively promote a positive working environment and “The A&P Way”. [email protected] or by post to 5-7 Grosvenor Court, Foregate Street, Chester, CH1 1HG.